As you prepare for the Easter season, your mind may immediately wander to the traditional White Easter Lily. For those looking for a bloom with a broader color spectrum, consider the beauty and whimsy of Azaleas! Azaleas have dainty, ruffle-like blossoms that come in white, pink, lavender, red, purple, instantly adding interest and color to drab areas. These easy-care springtime beauties are popular in the south but with proper care and a little love, they make the perfect addition to any garden bed! The azalea is actually a type of flowering shrub belonging to the genus Rhododendron. These plants require little maintenance but offer a big reward in terms of blooms. Most varieties prefer partial sun/partial shade. Plant your azaleas on the north or side of your house where they can receive warm morning sunlight and cool afternoon shade. Azaleas require rich, well-aerated, well-drained soil that is evenly moist, but not waterlogged. 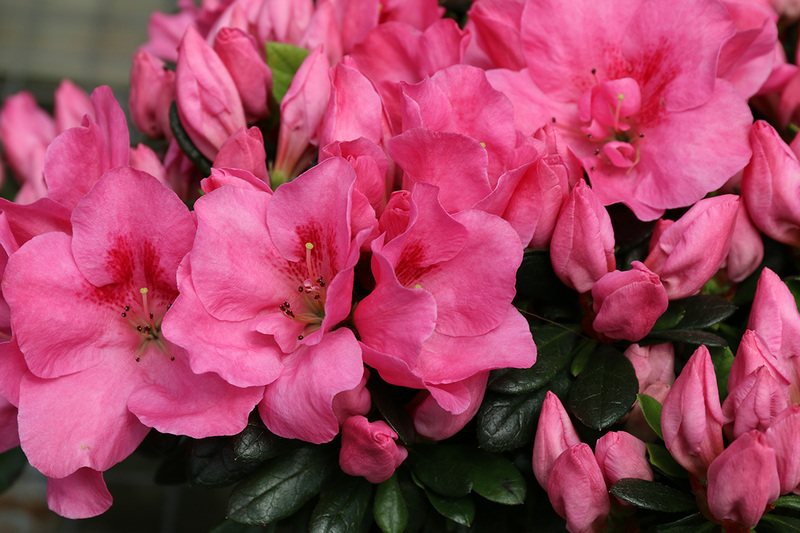 Azaleas are “acid-loving” plants that prefer acidic soil with a pH range between 4.0 and 5.5. Because of their shallow roots, you’ll want to plant your azaleas so that the top of the root ball is even with the soil line. The type and amount of mulch changes from variety to variety so check with a professional gardener (like a member of our staff!) to see what they recommend. Apply a layer of mulch around the plant’s roots, being careful not to create a dome or mound around the plant, to keep the soil moist. Ideally, you’ll want to mulch in the spring, not winter. If you mulch too late in the growing season, it can delay your azaleas from going dormant. As long as your azaleas have space to grow, your plants should not require much pruning. The best time to prune is in the spring after they finish blooming. Cut back any extended branches to reshape your plants or remove dead or damaged branches to encourage new growth. Get ready for the Easter and spring season by visiting Bengert Greenhouses. Not only will you find beautiful ready-to-plant potted azaleas, but you will also find everything you need to prep your garden for summer. We proudly offer mulching services in addition to our wide variety of plants and flowers, all of which are locally grown in our West Seneca Greenhouses. Contact us today to learn more!